One of the few destinations within city limits that makes you feel like you are in the mountains. East Palisades gives trail runners and hikers some grueling hills, narrow trails and beautiful scenery. Steep, rocky descents toward the Chattahoochee River coupled with some rock scrambling, narrow trail ledges and a bamboo forest- that’s the East Palisades trail. The 6-mile loop begins with a steep hill where wooden steps are built into the trail to aid in your descent down to the river. Watch your footing if you are running, because while the trail is wide, rocks and roots grab at your feet. At the base of the hill, the trail meanders along Long Island Creek’s shoals before meeting with the Chattahoochee River. Soon it departs from the banks and weaves back into the woods for steep climbs and switchbacks. After crossing a bridge at Cabin Creek, keep your eyes peeled for a few of the must-see spots, such as the bamboo forest and scenic cliff overlooks. When the water table is low, the river is clear and slow moving, offering beautiful views of both Long Island and Devil’s Race Course shoals that are normally covered during high water. A morning run is your best opportunity to catch fog rising off the river, much how your breath swirls around you on a cold winter day. Use the map for navigation, and be sure to head to the summit of East Palisades. Follow the side trail from marker EP 8 down a set of stone-like stairs and you’ll end up on a rock cliff. You’ll see the Devil’s Race Course shoals and some of Dunwoody’s taller buildings poke out from the trees to the north. Early morning sunlight paints the tops of trees a honeyed orange. The view is much more revealing in the winter, but equally beautiful with the lush greenery in spring and summer. Another point of interest is the towering bamboo forest, which can be found by rejoining the trail from the summit and traveling north. Make left turns at intersections and you’ll find yourself at EP 16, which leads along the river to the forest. As one trail runner described, this is the place where Zoo Atlanta’s pandas would escape to live forever sheltered by the 30-foot tall bamboos. 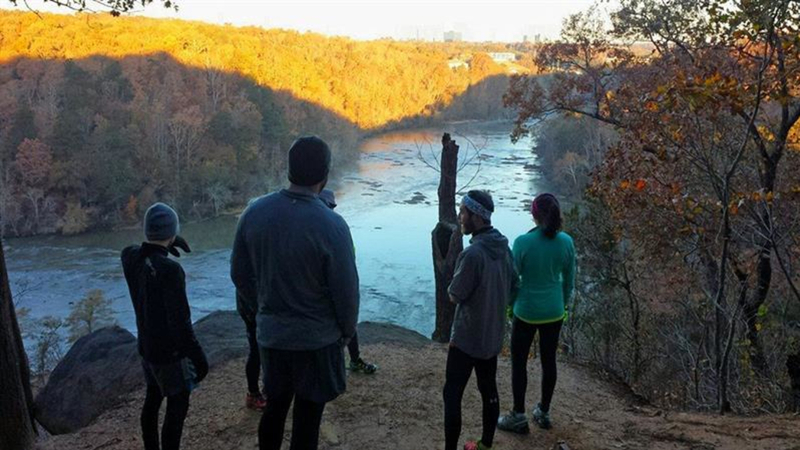 Continue north to rock scramble up a series of stacked boulders and you'll reach another scenic cliff that offers views of the Chattahoochee River. Unless you want to bushwhack, it’s best to retrace your steps and climb down the boulders. Continue your hike or run clockwise to rejoin the trail at EP 23 and find your way to the Indian Trail parking lot. The trail can be aggressively hiked at a fast pace and it also has some brutal hills and rock hopping that will challenge trail runners. For boulder climbers, will want to stop at the Palisades rocks to try out some crack and face climbing. 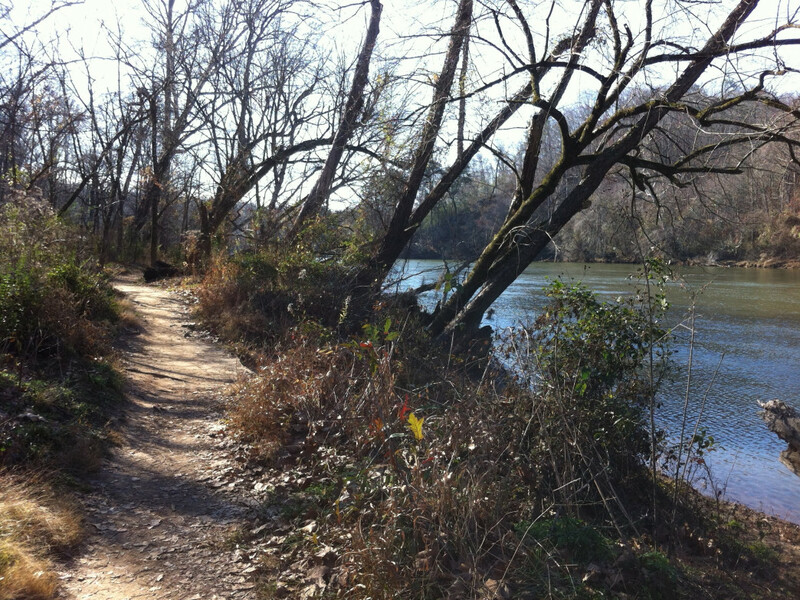 The East Palisades Trail is part of the Chattahoochee River National Recreation Area on the eastern banks of the river. From downtown, you can access the trailhead from I-285 East. Exit on Powers Ferry Road, and drive west on Northside Drive. The parking lot is at the end of Indian Trail NW. The gravel road is narrow and there are several potholes, so be careful as your car bounces down the gentle slope to the parking lot. One trailhead, EP 19, is located at the edge of this parking lot, while another trailhead, EP 13, is located less than 0.25 mile down the gravel road. Another parking lot is located at the Whitewater entrance. Continue south on Northside Drive and turn onto Harris Trail NW and follow the road to the gravel lot. This trailhead begins at EP 1. If you have plan on taking a dip in the river, it is best to check the water levels for Vinings Cobb Parkway and Vinings Paces Ferry before you go. Water levels under 5 feet are ideal. During periods of water releases from the dam at Lake Lanier, the current is very fast-moving, and the temperature stays around 50 degrees. To check water releases, you may call the Buford Dam at 770-945-1466 or check the water levels (which are posted once a day, every day at 10 a.m.) at www.srh.noaa.goc. The area is dog friendly, provided that they are leashed at all times. The area is highly patrolled, and you will be ticketed if a Ranger sees you disregarding this rule. You are likely to run upon some litter on your hike, due to the fact that the area provides no trash cans (only pet waste receptacles), so hikers are encouraged to bring their own trash bags and pack out trash.